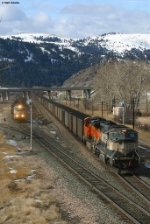 Description: A DPU unit is shoving at the rear of the first coal train. Description: A mixed merchandise waists for permission to move at the north end of Conway Yard. Description: Located at the north end o Conway Yard. Description: A northbound coal job comes past Joe's Carpet about 2 miles from the end of the Ft. Scott Sub. 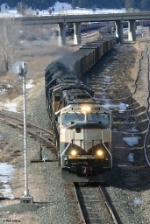 Description: An empty coal train heads north on the Ft. Scott Subdivision. The picture wasn't very well lit, so I used the "Sephria" feature and I think it looks pretty cool. Description: We catch a SD75M and a SD70MAC lead a coal train on the Lakes Sub., just after it met BNSF 5960 North, when it came off the Hinckley Sub. Description: Empty coal train E-BENJRM. Description: And an execumac on the rear, to boot! Description: Three execumacs in 2009 - not a bad feat! Description: At Bearmouth siding, the train picked up MRL 304 for forwarding to Livingston. Little did the crew know the dispatcher had another pickup in mind for them! Description: Fairly full yard at Garrison today for the train from Butte. Description: The RBESCM power has just tied onto the RWMCEC's power and the conductors are working on splitting things up. Description: With all 6 units, back on the train. 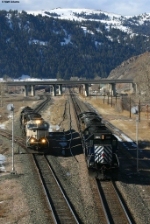 Title: 2 BNSF Mac's lead a corn syrup train WB! Description: These Emd's were screaming down the Transcon.